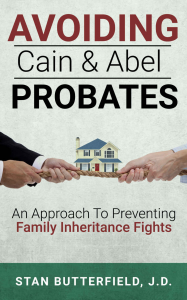 You have the power to keep your family from fighting over your estate! Families fighting over estates; it’s so common that it is hard to find someone who has not been impacted by these types of conflicts. Hurt feelings, estrangement, and alienation of family members often happen after an estate fight in a family that previously was close and harmonious. Author Stan Butterfield is a probate attorney that has on a personal or professional basis been dealing with estate conflicts for decades. Stan will explain how his own family was disrupted by an estate fight and how this motivated him to find a method for peaceful transfers of estate property. Keep your family from fighting—buy this book today!